Hey guys, so it's Mr.EasyBB here with some interesting news I'm sure you would all love to read about. We have integrated the KandiChat 1.0 Beta Release on EasyBBTutorials. Remember KandiChat (Kandi Designs) is the company I run. And we have been working hard to release this for all of you to enjoy. The only way you can successfully trial our chat is if there are other members on. Status Features- You can change your status within the new chat, and automatically have everyone see it. Some of these features you won't see right away since we are still in beta and already have a few minor bugs (CSS matching website CSS). Please if someone is on why not give it a try and let us know if you find any bugs, and if you would like to suggest something for later releases. *ANYONE FOUND TRYING TO DUPLICATE KANICHAT IN ANYWAY WILL BE PERMANENTLY PLACED ON A BANLIST TO MULTIPLE WEBSITES, AS WELL AS LEGAL ACTION TAKEN SERIOUSLY. ALSO YOUR SITE WILL BE DUPED AS BANNED ON SIGN UP TO KANDICHAT! is there any relation to this? No not a chatbot lol. 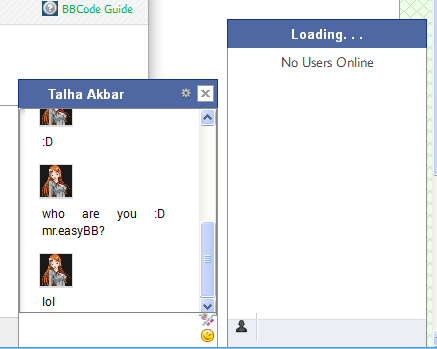 That is my co manager of KandiDesigns Muhammad Talha Akbar He gets on now and again processing through our server. No worries. Will there be any option in the future that you give this coding for members to use on their site, it is great!? Yes, once everything is worked out and the beta doesn't need anymore testing we will be selling Licenses. Security is must. So when we will sell this, you must give us the URL that you will be using, and of course some other information. Then in the code you will have to set an API key, thus our script will run the API key versus the url to see if they match, then checking the actual window location and if they match then run. It sounds like a lot but it will be very fast. There will be a lot dealing with this, we just wanted to see your reactions and see if this was still worth going through with or not. KandiChat is a new chat system easily customizable with themes, sounds, avatars, and so much more. Created by KandiDesigns (My business) we are still having trouble with our server so I keep taking it off because it keeps overloading with errors since the server goes down it keeps sending request which can't follow through. Now this doesn't mean the Chat is bad, just we have a cheap server for right now lol. I will be making a check on some things and seeing what I can do as far as servers go. That sounds cool! I can't wait to see it! So that everyone knows for KandiChat full release, coming hopefully as soon as we fix all bugs and issues. Active members here, (Points are the way we will tell you are active) will be getting ONE MONTH of a free membership of the KandiChat, to get a feel for it. If you like it you can easily start a payment plan, if you don't it just won't appear anymore on your site. Also we will be doing a points system again, and members who are Plus Members will be getting bigger discounts. Members with a certain amount of points will be eligible for a free months of service. I will be posting some information on how to earn points and so forth. Thanks Bl@de, so far you're the only Plus Member since we technically haven't set it to full sail yet, but you'll be the only one to get the amazing deals and discounts for KandiChat and other services coming soon. ok mate. me and runaway was talk in a lot on KandiChat to day. it is very good. u have done a very good job. u can tell i have not been here for a bit there is so much new and better stuff on here now. u have done a good job mate u and runaway. I know easy is going to put it on a new server so it should be up and running all the time real soon now. that will be cool i think u will do well with it. I'm not going to do well with it but easy might. Its not my project I had nothing to do with it. There are so many bugs at the moment. Ok so I contacted my server provided today, the reason why it has "bugs" where it doesn't display sometimes is because I am using a the Free hosting, and since it is a chat it uses a lot of request to the server, so they basically put a hold on any data. I am looking into the price for the paid version and we will have %99.9 uptime all the time!